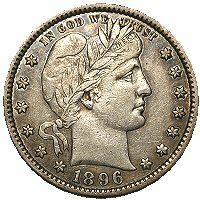 In 2006, the Barber Coin Collectors' Society conducted a Census of its members, as well as the collecting public, for Barber Quarters. 120 people responded, including 90 BCCS members and 30 guests via the Internet. The following table lists the results of this Census. New surveys will be conducted for the other Barber series (including Liberty Nickels) in the coming couple of years. To review the important caveats to consider when interpreting this data, please see the comments on the Census project description page.